Blackpool’s victory in the Championship play-off final yesterday guarantees them the biggest payout in the history of global sport for any one team or sportsman as a result of one single match or fixture: £95m. That £95m is extra income they will get because they won that one match. It is income they would not have got if they had not won. That makes the 2010 play-off the single most lucrative sporting event of all time. A more extensive breakdown of how the £95m stacks up can be seen in this piece today for the Sunday Times; in short, £40m for finishing bottom of the Premier League next season, £48m in parachute payments, and £7m in extra income from one season in the Premier League. The £95m of earnings – albeit to be accrued over a period of time – from a single result puts into sharp focus how massively lucrative membership of the Premier League is. That’s why the Championship play-off is all or nothing. (Or nearly nothing; yesterday’s losers Cardiff get to keep the gate receipts). 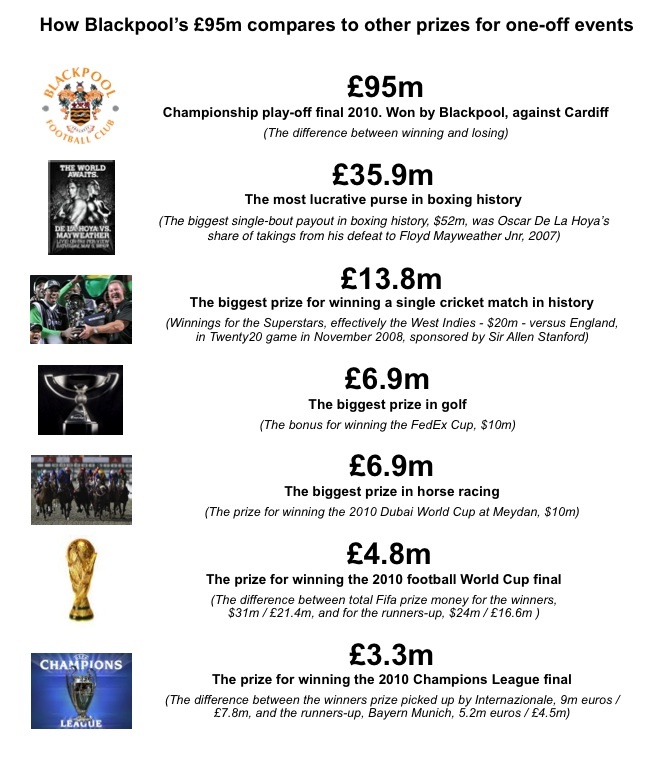 As a one-off occasion, the £95m purse far outstrips earnings from any other one-off event in sport. Prize fighting comes closest to these levels but even the biggest single-bout payday in history was “only” $52m (£35.9m at today’s exchange rates) for Oscar De La Hoya as his share of the purse for losing to Floyd Mayweather Jnr in 2007. Various surveys and pundits claim the Champions League final is the most lucrative event in sport but this is, simply, nonsense. The Champions League as a whole tournament is lucrative for those taking part. A winning campaign, typically over 13 to 17 matches, can net as much as £70m in prize money, TV cash and extra commercial income. But that money accrues from cumulative success, not one match. The prize at stake for winning the final itself is not so great: the difference between winning and losing last night’s final, for example, was as little as £3.3m – which was the difference between the winning cheque picked up by Internazionale and the losing cheque picked up by Bayern Munich. Certainly Inter may now recoup a few million more from sponsors’ bonuses, but even including these, victory from the one match was minimal set against the booty on offer for winning the Championship play-off. Using the same logic, winning the World Cup final this summer (as opposed to losing it) will be worth £4.8m, which is the sum at stake in the 90 minutes. The sum at stake in the 90 minutes at Wembley yesterday was £95m. Some other big prizes for one-off events are below.